My boys and I have really interesting discussions. And they truly do say the darndest things. Today they were fighting with foam swords.... Big Dude: "Prepare for a beating so severe your great great grandchildren will be sore!" Little Dude: "As will your slap happy grandpappy!" Honestly. Where do they come up with this stuff? This morning on the way to school we were discussing the election. Again. A couple of years ago little dude got quite upset when he realized he couldn't vote until he was 18. "I am an American citizen!" 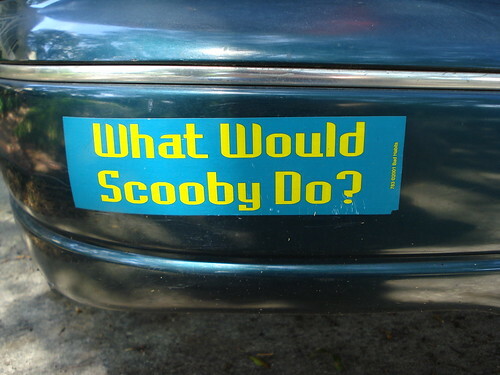 This morning we decided that a Scooby-Shaggy presidential ticket would be the bomb. Stay with me here. Scooby and Shaggy don't like scary things. So they would ban scary things. Like war, the boys suggested. Ok, I'm all for that. Scooby and Shaggy *really* like to eat. So no one would ever be hungry. I'm totally for that. Now maybe Shaggy might have some other liberal ideas I'm not so sure about, but overall, the boys made a very sound argument for the Scooby & Shaggy ticket in 08. 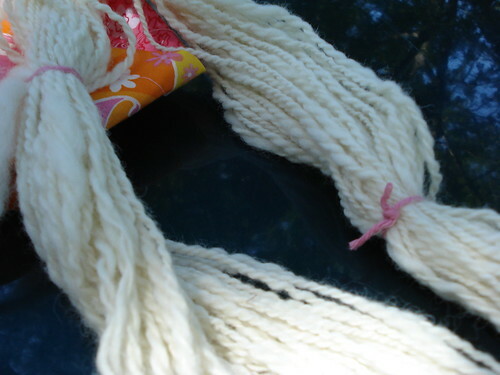 My spinning is coming along. 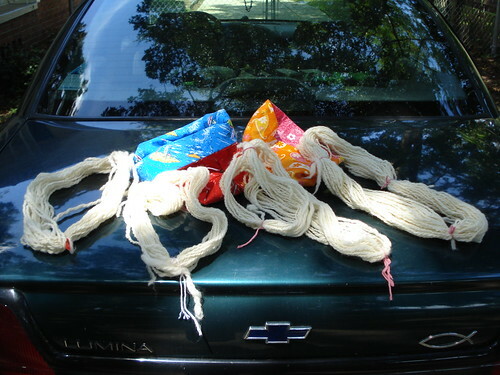 Seen on the back of the Scooby Mobile are my first four hanks of handspun. Along with some project bag prototypes I've been working on. It always takes me a while to get back into the sewing groove. Just for comparison, let's look at my first attempt vs. my fourth attempt. 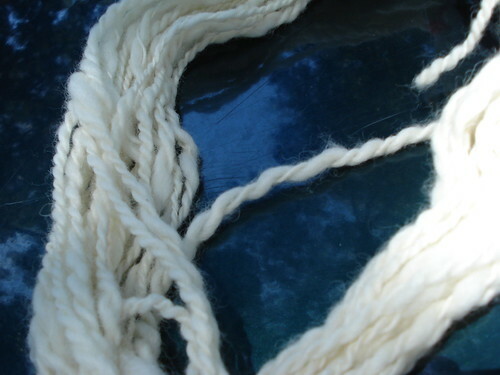 My fourth attempt has some very thin overspun places, but there are also good long stretches of very even stuff that actually looks like yarn. Next I'm onto the good stuff. I almost forgot to tell you my very exciting news! Sugarbee Studios is running a sock club! A fabulous sock club with her own wonderful take on color and her crazy sense of humor. Anyhow, the exciting part (for me) is that I will be writing the patterns for her club. I have all sorts of ideas and I'm very excited. How many times can one girl say excited in one little paragraph? Anyhow, check 'er out. You won't be disappointed!